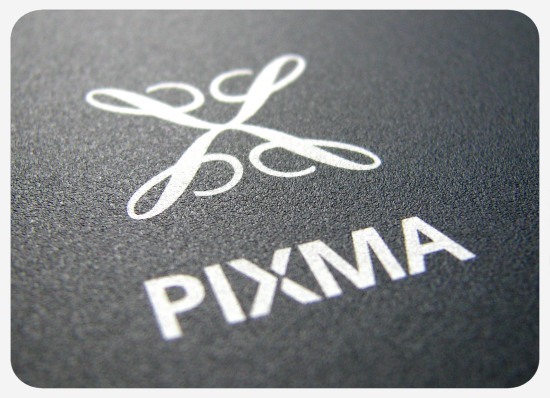 Last week, our nearly eight-year-old Canon Pixma iP4200 inkjet printer finally succumbed to a broken print head. Because it had a good run and a new head would cost almost as much as a new printer, we simply decided to get a new one. 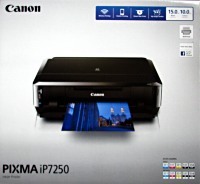 The requirements were an A4 photo printer with five single ink tanks and the capability to print on CDs and DVDs, making only one choice possible: the Canon Pixma iP7250, because it is currently the only non-multifunction printer from Canon with these exact characteristics. I did not even bother looking at other manufacturers because we had such a good experience with Canon, so the choice was actually very easy. After an attempt to buy the printer in a local electronics store, which was thwarted by the fact that this was the only printer they did not have in stock, we simply ordered it from Amazon and it arrived here on Saturday after a slightly longer shipping time which sometimes happens when ordering bigger articles from Amazon Germany. Unpacking and setting up the printer took about half an afternoon, but it was absolutely no problem. Because I’m not really good at product photography, there won’t be any unboxing photos, but they would not have been very exciting anyway. The top of the box contains some paperwork, a driver, software and manual CD, the ink cartridges and the power and USB cables. Everything else is contained in the printer itself. Look & Feel: The iP7250 makes a quite different impression than the iP4200 – it’s a shiny black box with a lot of glossy parts, making you feel like you bought a miniature piano. The size is about that of an hefty video recorder, less high than its predecessor but a couple of centimeters wider. Overall, the look is very nice, but because of the glossy surfaces especially on the front very prone to fingerprints and smudges – and, I expect, scratches. But this doesn’t bother me, because the printer is not supposed to win a beauty contest. The printer is as heavy as its predecessor and by no means rattly or cheap-looking – it is mainly made out of plastic, but it’s still extremely sturdy and you don’t have the feeling you can break something off when you open up the lids. Ink: The iP7250 has five separate ink tanks, four smaller ones for Cyan, Magenta, Yellow and Black and a second Black for text printing. Before I got the printer, I was under the wrong impression that Canon had not changed the cartridges, but these are completely new ones which seem to be slightly larger than those of the iP4200. There are apparently also XL cartridges available, but I’m not sure which ones the printer actually comes with. There is one interesting new feature on these cartridges except the usual chip: a prism which shows if the cartridge is empty – this means better control for the printer over the level of ink. The new cartridges have one regrettable downside: they are now black, making a simple visual inspection impossible, although there are transparent third-party replacement cartridges available. But most importantly, the empty warning can be disabled in the printer driver when the cartridges get empty, meaning you can refill the original Canon cartridges and use them again. Canon always warns of printing with an empty tank, but if you’re careful enough and refill as soon as you notice a colour getting empty, there is no danger of damaging the print head. There are lots of instructions on the web on refilling the cartridges, which involves drilling a small hole into them, so I won’t bother here with a detailed description. Paper: The big change from the iP4200 is that the top paper feed is now gone. This is not really a big loss, since it has been substituted with two completely internal paper trays under the printer. The bottom tray holds paper up to A4 size, while the top tray is dedicated to smaller photo paper up to 5×7″ size. The paper trays slide out easily and putting new paper in is just a matter of seconds and much more comfortable than on the iP4200. The bottom tray holds about 100 pages depending on which paper is used and the top photo tray has maybehalf that capacity. Both trays are specified for paper with up to 300g – I don’t have such heavy paper to test this, but both the 200g A4 and 240g 10×15 photo paper I usually print on were absolutely no problem. Since both paper trays are on the bottom of the printer, it also means that you can now put the printer on a low shelf or cupboard because no top access except the front lid for the print head is required. CD and DVD printing works perfectly in the same way as with the iP4200 by putting the disc on a tray which is then inserted into a slot in the front of the printer. The tray is actually a bit hard to find – at first I thought it was missing, but on closer inspection it turned out to be hooked under the top paper tray. Canon recommends using Verbatim printable discs and I do, too, since I’ve never had any problems with them. Speed: Fast. Very fast! Faster than the iP4200, and this was already a fast printer. The first time I printed an A4 text page, I thought the printer had accidentally spilled out an empty page! I only have printed a few 10x15cm photo prints so far, but on normal quality setting the printer takes only about fifteen seconds for one of them. I have not yet tried printing a photo in the full A4 size, but I expect this will take about a minute like on the iP4200, depending on the quality settings of course. The many complaints that the printer takes a long time cleaning when first switched on are simply overexaggerated – the iP7250 does not behave any different than its predecessors in this respect. Starting the printer after 24 hours or more of inactivity can take about 20-30 seconds or so, but afterwards it is instantly ready and once switched on it prints almost instantly. There does not seem to be excessive cleaning going on – only the first setup with the ink head calibration takes a little time, but this has to be done only once when the printer comes fresh out of the box. Noise: Some reviews also complain that the iP7250 is louder than its predecessors – this is actually true, but only by a very small margin. Since the printer is built completely different and has a flatters case, the rollers and the ink head sled are a little bit louder, but compared to the ear-splitting noise dot-matrix printers used to make, this printer is still actually whisper-quiet! Quality: Not having printed very much yet, I can’t yet make a proper assessment of the overall quality, but the first test prints look very nice and certainly not worse than those of the iP4200. Text print quality is excellent, but of course very much depending on the paper you print on – on cheap, thin copier paper the ink tends to bleed a little bit as usual. Photos printed on decent glossy paper look brilliant, but achieving exactly the right colours can take some fiddling in the printer drivers with different paper types and colour settings. I have not yet found my personal preferences yet, but this can simply be achieved by printing a photo several times with different settings and then choosing the best result. This is nothing out of the ordinary and is exactly the same experience I’ve had with the iP4200 in the beginning. Software: Canon supplies a bunch of programs on CD under the umbrella of My Image Garden, but you don’t need to install any of these to actually use the printer and I haven’t even tried any of them out. Instead it is possible to only download the driver for the iP7200 series directly from the Canon website to get the current version, which seems to be higher than the one that was supplied with my printer. This installer contains everything you need if you use your own programs anyway and has hardly changed at all over the years. I have read that Canon’s new CD label printing program is horrible, but the old program that came with the iP4200 still works fine as do other programs like the Nero Cover Designer. Connection: The days of the famous Centronics interface are long gone, but the iP7250 has, of course, the standard USB 2.0 interface – and is additionally WiFi capable. This means that although the printer cannot act as a standalone WiFi server, it works fine as a WiFi device over an access point, which is equally as good. Setting up is done during driver installation: the installer asks if you want to use the printer over USB or WiFi – the latter setup can be either done wireless through the WPS system if the router supports it or manually with an USB connection. This involves choosing your access point and connecting the printer to it – once this is done, the printer can work over the WiFi access point without having to be physically connected to a computer. A computer does not have to have WiFi itself to access the printer, it only needs to be connected to the physical network the WiFi router is part of. I have not yet tried out if the WiFi connection is slower than printing over USB, but both USB and WiFi drivers can be installed at the same time on a computer. Canon also has a printing software for Android and iOS, but only with a very limited functionality for photo printing. The bottom line is that the Canon iP7250 is a perfect replacement for the iP4200 if you want to use it as a low-volume (e.g. not printing whole books and hundreds of images at once) document and photo printer. With the right refilling strategy the running expenses are not nearly as costly as often is claimed and if the printer proves to be as long-living as the iP4200, the low purchase price of 77 Euro was very much worth it. I can recommend this printer without reservations.